Dubai, United Arab Emirates: Microsoft introduced the region to the power of artificial intelligence at this year’s GITEX Technology Week. Visitors to the Dubai World Trade Centre’s five-day event were surprised to learn just how far cognitive reasoning, natural-language processing and bot AI have come, as they wandered through specially constructed Experience Zones at Microsoft’s stand. 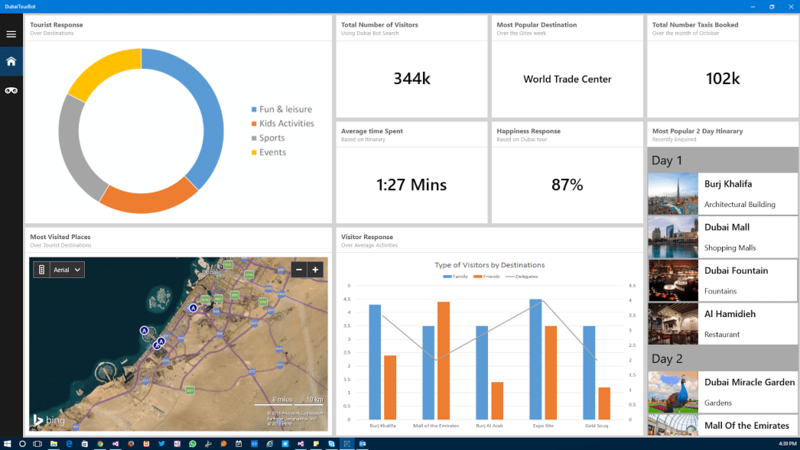 Dubai Bot, a showcase demo developed by Microsoft Gulf, acts as a virtual tour guide for visitors to the emirate, giving them an AI source for all their travel needs. It can suggest restaurants and entertainment venues; museums and beaches; and ideal attractions for children, parents or the lone traveller. The bot also helps with the more formal aspects of travel, such as booking a taxi, advising on use of the Metro or giving up-to-the-second updates on currency exchange rates. All of this interaction is based on the bot’s knowledge of the user’s circumstances, such as their length of stay, age and whether they are travelling alone or in company. Dubai Bot presents an ideal application for Microsoft’s Bot Framework and Cognitive Services, which are best suited to scenarios where repetitive tasks normally co-ordinated by human actors can be handed over to automation. The bot uses Cognitive Services’ Language Understanding Intelligence Service (LUIS) to perform real-time natural-language processing, allowing meaningful, on-the-spot conversations or text exchanges with users, via smart devices. The Microsoft Bot Framework lies at the core of the solution and enables straightforward integration with popular communication channels such as Skype, Slack, Telegram, Facebook Messenger and email. Through its Application Programming Interface (API), the Bot Framework allows you to build applications that your users can naturally interact with wherever they are. The bot applications connect natural conversations with underlying functional tasks such as displaying maps, retrieving traffic information, booking accommodation, calling taxis and suggesting restaurants. Kintrans ‘Hands Can Talk’ is a sign-language interpretation software based on KinTrans patent-pending technology developed in Dubai since 2013. Named one of the region’s most promising start-ups by Forbes Middle East in 2015, Kintrans built its breakthrough app using Microsoft Cognitive Services and the Microsoft Kinect, the movement-sensing peripheral most commonly associated with the Xbox gaming console. Kinect gathers movement data from those using sign language to communicate. KinTrans technology processes the movement data and converts it into words that are conveyed, as text and synthesised speech, for those who do not understand sign language. Cognitive Services detects spoken language and translates it to text for the sign language user to read. The conversation happens in messenger-like screen application. Aimed at employers, schools, government institutes and public service centres, Kintrans enables two-way conversations between parties that would otherwise be unable to communicate effectively. Kintrans started life through Microsoft’s BizSpark programme, an initiative designed to empower start-ups across the globe. Microsoft has been working tirelessly to convince regional start-ups that emergent technologies like the cloud put cutting-edge AI, such as Cognitive Services and the Bot Framework, within reach of every scale of business. In addition, Microsoft has scheduled over 15 onsite meetings with Gulf start-ups as part of the Connect programme, where Microsoft mentors will talk to start-ups about a variety of technology-related best practices.